Yosemite National Park located in Sierra Nevada mountain range in Central California USA is an hours drive from San Francisco, Los Angeles and Reno. Historians date the story of Yosemite to about five hundred million years ago when the Sierra Nevada region which lay beneath the sea thrust itself outside the sea level. Weathering and erosion with molten rocks and glaciers gradually carved the face of Yosemite, which proudly stands as the National treasure of America today! Yosemite National Park extends to an incredible 1170 sq miles with altitude ranging from 2000 feet to 13000 feet above the sea level. Waterfalls, giant Sequoias, hiking to the Glacier Point, driving to Tuolumne Meadows...Yosemite offers a host of activities to the discerning tourist. The Tuolumne Meadows in Yosemite Park has some rugged and sublime scenery, with the largest sub alpine meadow in Sierra. It is full of spectacular wild life and wild flowers during summer. The Tioga road is a scenic highway - sparkling lakes, fragile meadows, domes and lofty peaks that lay 10,000 years ago under glacial ice. The Yosemite Valley is the world's best-known example of glacier carved canyon. Leaping waterfalls, towering cliffs, rounded domes and massive monoliths make this valley a natural marvel and photographers delight. The Yosemite Valley is full of wildflowers and shrubs, oak woodlands, mixed conifer forests with incense cedar and Douglas fir. Monarch butterflies, mule deer, black boars and other such wildlife flourishes here. Sequoia groves: Many mature sequoias groves are found in Yosemite National Park. Three of the groves are most famous. They are the Mariposa grove, Tuolumne grove and Merced grove. Other than the historical Sequoias, there are many varieties of trees found in Yosemite Park. The California black oak with its yellow green and dark trunks, the incense cedar with its feathery reddish bark, the ponderosa pine trees made up of irregularly shaped plates and dark furrows are some of the trees worth mentioning. Climbing: Yosemite offers the world's best natural climbing areas. From the crack climbs of the Merced River to the sun drenched Tuolumne domes and the big walls of the valley, you can experience it all. Stargazing: Thousand of tourists enjoy looking at the constellations of stars and planets through binoculars at Yosemite. Telescopes are also set up at Glacier Point for the visitors to enjoy stargazing more closely. Swimming: Yosemite National Park permits swimming in all bodies of water in the park except the Hetch Hetchy reservoir and the waterfalls. The tourist can cool off swimming in the Merced River. Happy Isles: It is often said that no tourist can leave this place unhappy. The Merced River rushes around two little islands which are striking to watch. The Vernal and Nevada Falls trails begin here. Yosemite Valley: Yosemite National Park houses the Yosemite Valley which is strikingly beautiful. The flat floor of the valley contrasts with the nearly vertical granite walls over which several major waterfalls pour. The valley is world famous for its impressive waterfalls, cliffs and rock formations that are rare to see. Yosemite waterfalls: Yosemite waterfalls are the largest in North America and the fifth tallest in the world. The upper and the lower falls are connected by the intermediate cascades drop 2,425 feet. Glacier Point: From the rim of this Yosemite Valley, take an eagle's view of the commanding 3214 feet down to the Valley floor, Half Dome and High Sierra. The Glacier Point can be reached via skis or snowshoes only. Tunnel View: From here one can have a classic view of Yosemite Valley, including El Captain, Half Dome, Sentinel Rock and Cathedral Rocks as well as the Bridalveil Falls. El Captain: This place is popular with rock climbers from throughout the world. This is a massive monolith made of the largest single granite rock on earth standing 4000 feet from base to summit. Mirror Lake: This Lake projects impressive view and mirror reflections of the Tenaya Canyon during early summer and spring months. Half Dome: This is one of the most favorite distinctive features of Yosemite. Half Dome rises 4,733 feet from the valley floor and at 87 million years old, it is gauged to be the youngest plutonic rock in the valley. Tuolumne: There is a grove of giant sequoia trees in Tuolumne. Tuolumne meadows are the largest sub alpine meadows in Sierra Nevada. Californian big horn sheep are a familiar sight in these meadows. The season for sub alpine flowers begins in late summer. One can watch Elephants' head, gentian, pentstemon, yarrow and shooting stars. Wawona: Located inside the Yosemite National Park in a beautiful mountain valley, Wawona is a small community of vacation homes and cabins. Tourists pass through Wawona on their way to the Valley floor. Wawona is located at an elevation of 4000 ft and has a mild climate year round. Mist Trail, Vernal Fall and Nevada Fall: The Mist Trail is popular with young hikers, in Yosemite Valley for its undulating climb alternating with steep and milder gradients. The hike starts with Happy Isles and climbs beside the scenic Merced River to the Vernal Fall and Nevada Fall. The Mist Trail becomes strenuous to climb beyond the Vernal Fall. The Nevada Fall is awesome in its scenic beauty. Yosemite Cemetery: West of the Yosemite museum is the Yosemite cemetery. This cemetery is historically reputed and buried in the cemetery are people who played an important role in the development of Yosemite National Park, as well as Native Americans and casual park visitors. Tourists to Yosemite National Park have a choice of accommodation 'within' and 'near' the Park. 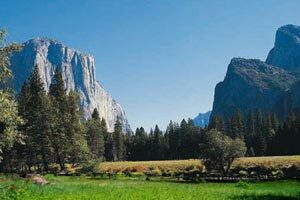 There are a variety of accommodations available for the tourists within the Yosemite National Park from unheated canvas tents to heated cabins. Accommodations also range from plush elegance to comfortable lodges and historic cabins. Many of the lodges offer value added packages and specials that include world class cooking and wine seminars, yuletide feast and bed and breakfast packages throughout the year thereby making the stay and experience of the tourist visiting Yosemite more memorable. The best time of the year to visit Yosemite would be from June to September. During this peak time, all areas of the Park are accessible by car. The climate is warm to hot with occasional rain during this time. During the months of December to March, it is snowy at Yosemite. Most of the roads are closed and inaccessible for the visitors. However Yosemite Valley and Wawona remain accessible by car all round the year. The perfect time to visit the waterfalls would be April and May but many roads especially the Tioga and Glacier Point roads would remain closed due to snow at this time. The climate could be highly variable with sun and occasional winter storms. Daunting rugged natural valley and giant waterfalls, transparent rivers, granite domes, extensive high mountain alpine wilderness and mountain peaks, meadows and groves of towering sequoia trees, acres of preserved wild lands and spectacular high country scenery ... all at Yosemite National Park! First Published Date: Nov 23 2006 Last modified Date: April 25 2019 This page may have been updated recently as new information is available or the content may have been edited for better readability.